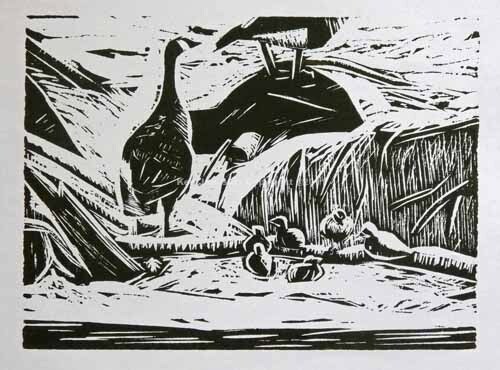 Last Sunday I intended on doing some final tweaks to the geese and goslings linocut and then printing an edition. But when I stepped out the front door I found a dead junco on the sidewalk. Though most bird art, at least western bird art, had been based on dead specimens until at least the mid nineteenth century and the invention of photography, I've never worked from a real specimen, either my own or that of a museum. But obviously it's a long and honored, not to mention necessary, tradition. It's surprising to read about John James Audubon going out hunting for specimens and talking about having a good day hunting. But that's the way most bird art, or naturalistic, scientific study has been done. We tend to forget that with our high powered optics, whether in binoculars, scopes or photographic equipment. So, sad as I was to find a dead junco, I still decided to bring it into my studio and do a drawing or watercolor of it. The result is at the top. It was informative in that I could really see how the bill is built, how the feather tracts lie, etc. Recently I read that dead birds shrink in size so that my partially explain why it seemed so astonishingly small when I picked it up. Largely though I think it's just that birds are really small. That makes their migratory accomplishments all the more impressive. In any case I was happy to have the opportunity to portray this unfortunate bird. 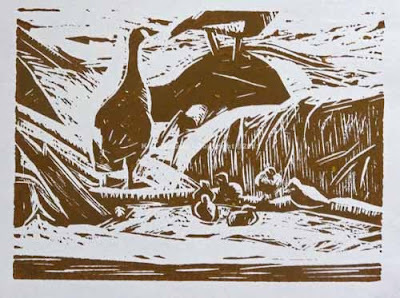 On Monday I finished tweaking the linocut and printed an edition of 12 on cream Rives Lightweight paper. Most of the copies are for sale at my etsy site. I'm still not really sure what to make of etsy. At times it seems that it's hard for anyone to ever find anything. And yet many people, mainly crafters, do seem to sell a fair amount of work. Fortunately there is the printsy blog site that lists etsy members that are also printmakers and members of printsy. That's at least a starting point for finding prints there. Printsy also includes interviews with printsy members, including yours truly, selections of new work, and occasional tutorials. I think I might not have tried etsy if it weren't for printsy. As it is I have a few non-print items on my site but soon it will be only prints. All of my work is available for sale at my primary online store. But I thought it would be interesting to try etsy and to have more inexpensive works, specifically prints, for sale there. Just a quick post since it's been awhile. It was almost exactly a year ago that we saw two Canada Geese with their goslings lit by brilliant sunshine. It made the down of the goslings glow in such a way as to make them look as though they had halos. I did a quick watercolor back then and this is based on that watercolor. I knew there would be one serious problem though. 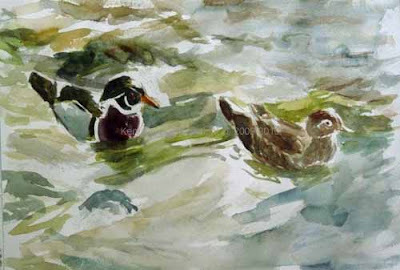 Light is best portrayed with areas of tone, as in watercolor. It doesn't work so well with lines. 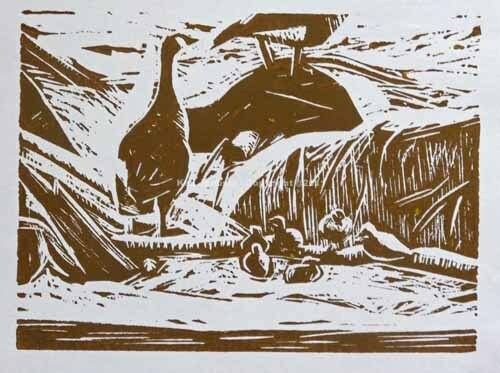 But linocut thrives on line, not tone. I know. But I finally decided to do it anyway. Sometimes you just have to take chances. The two photos here are the exact same state of the lino. They're just printed in different colors. I had been using a burnt siena/yellow mix that gave me a bronzish color. I thought that would add to the sense of light. But on the last print I decided that maybe it wasn't working. So I printed the image again with some black added. So that's why there are two colors. I"m going to let this sit overnight and probably will do some minor tweaks tomorrow. Then on to an edition. This time of year is always First Of Year time, first birds of a particular species seen in any given year. Some might also call it spring. It surely is indicative of spring. Though Icterids, the blackbird family, are the true FOY migrants in our part of the country they're not quite as closely associated with spring, perhaps because they arrive before there are any other real sings of spring. But Eastern Phoebes, Tree Swallows and Kildeer really do signal the start of warmer weather. I and my wife Jerene often go out in search of FOY birds starting in early March. I used to also bring my camera, take photos, and then do artwork based on them. I couldn't wait to get the photos developed and then do some paintings based on them. But today I really wanted to force myself to do field sketches first and photos second. That's exactly what happened. And the birds cooperated. All except the four Eastern Phoebes. You would have thought with four of them that at least one of them would have sat still long enough for me to sketch one. But no. The best I could do was get part of one, then hope that another view of him or one of the others would allow me to complete the sketch. That's how this Eastern Phoebe got down on paper. For some March is the thrill of March Madness and the Road to the Final Four. I used to enjoy that. 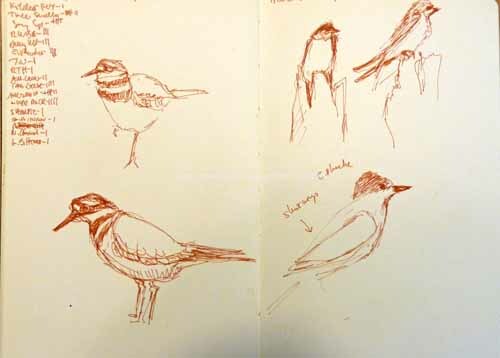 But now it's easy to skip that in favor of getting outside on a sunny but brisk day like today, seeing the first migrants of the year and getting them down on paper. That is the true March Madness. Hypnosis. There are certain bird species that are just so beautiful in themselves that someone looking at them, and in particular someone trying to portray them, can get hypnotized by their beauty. I had this experience when we drove by our first Ruffed Grouse in the Dolly Sods Wilderness Area in West Virginia last fall. I guess it was fortunate that I was driving and didn't have my camera at the ready. Otherwise I would have tried to get some photos and then eventually try to render that in some artistic medium. The problem, as with the male Wood Duck, is that you get hypnotized by the complex patterning and often end up with a lifeless artwork. 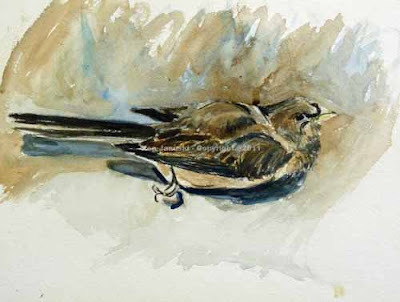 Far more important in wildlife art, or any art really, is getting a sense of life. If you can get the sense of life AND intricate detail and pattern fine. If not my feeling is that you should skimp on the detail. 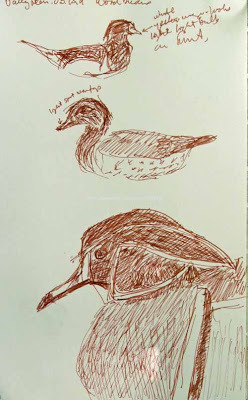 I saw my first returning Wood Ducks in Philadelphia a week or two ago. But over the last few days I've seen them in numbers, between 12 and 18 altogether on the Wissahickon is an educated guess. One of the hardest parts of wildlife art, especially bird art, is capturing the subject on paper before it moves. Both Tim Wootton and Nick Derry emphasize in Tim's new book mentioned in my last post that most of your time should be spent looking, not pushing the pencil around the paper. So with that in mind I resolved to put in into practice over the last few days. But it ain't easy! 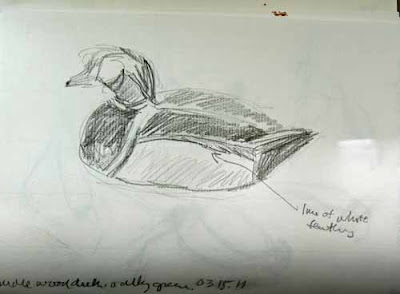 Ducks are perhaps more difficult, at least if they're being whisked out of sight by a current, but Wood Ducks are even worse. My brain almost short-circuited as I tried to figure out what I was seeing, make a visual memory of it, then put it down on paper. Even on the less gaudily patterned female that huge eye spectacle complicates things vastly. I often end up with a blob with a weird eye in the middle. My attempts at field sketches are above. The end result was that I also took photos. And when I got home I decided to try a larger, ca. 15x11 inch, watercolor based on the photos. But I ran into the exact problems that I expected. The pattern of the ducks, especially the male, is so complicated, and beautiful, that I concentrated on it above all else. I did this even knowing of the danger. But that's one problem with photos. If it's right in front of you you're sorely tempted to just put it in. In the field you can't do this. You have to make quicker, and probably better, decisions as to what to keep and what to skip. I think I resolved this successfully. But it's interesting to compare it to the first wood ducks of the spring that I painted last year on almost the exact same date. I also did some horrible field sketches that day. This is based on a photo. But in that case I didn't worry about detail. I was more concerned with the overall painting. In some ways I prefer it. But enough of art theory and practice. 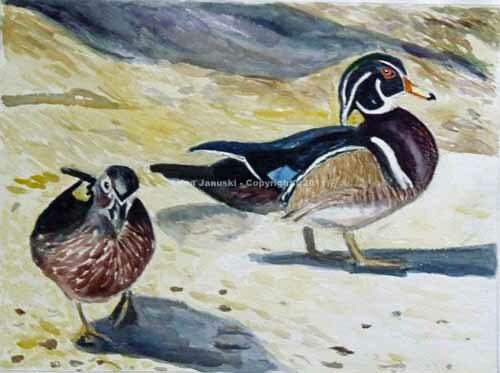 It's always happy sign of spring and summer when the Wood Ducks return. I kept thinking there was an abundance of American Goldfinches yesterday at the Wissahickon also. And then I realized it was the squeak toy greetings of the Wood Ducks. And I don't think there could be any more worthwhile way of spending time than with nature and with art. When I first started using birds as subject matter in late 2006 there was really only one person, place, thing that inspired me: 'Drawing Birds', a book by John Busby. So thrilled was I by it that I wrote a review of it at Amazon. 'Inspiring is the Word' was the title of my review and I think it summarizes my feelings pretty well. It was, and still is, inspiring. 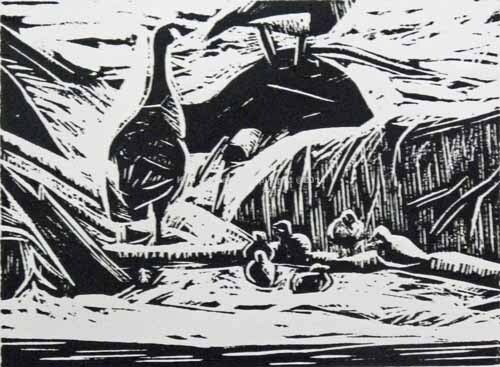 Most inspiring was the liveliness of the work, the sense that the illustrations of work by various artists was actually done by someone who had seen the actual bird and felt the excitement of seeing and portraying it. No lifeless photographic imitations that reminded me more of photos than of nature and birds. There was just one problem. I loved the work I saw in the book, and I loved the philosophy of drawing from life espoused by the talented artist/author John Busby. But where could I go next? How could I follow this path of working from nature. Very few American artists that I could find did so: namely Barry Van Dusen, whose work was in the Busby book, and Debby Kaspari, especially in her various posts about drawing birds. These were a start but still I felt like I was operating alone in the wilderness. This was particularly true in my desire to meld art and nature, not just do illustrations of nature. Jocelyn Oudesluys on the Art section of The Nature Blog Network and she mentioned that he hung out at the Wildlife Art section of birdforum. To make what's already a lengthy story a bit shorter I finally found a world in which I no longer felt myself an alien. Working from life, combining art and nature were all as natural as can be. And the most generous, thoughtful, constantly available person there was Tim Wootton, the artist and author whose book I've illustrated at top. I'm sure I've mentioned before what a bunch of talented, helpful, interesting artists hang out there. Many of the most talented have their work showcased in his new book. Since I know many of them, at least as 'online' friends, I can't really give a very objective review of the took. I recieved it this weekend and have read it fully once and flipped through every illustration twice. I'm sure I'll be going through it many more times. That tells you something. I do think Tim's book will join John Busby's as classics in the field of wildlife art and art based on nature. The one thing that I can quite honestly say is that if you are interested in being a serious bird artist you'll run into many questions: Should you work from life? If so how in the world can you draw something that moves so quickly, that may move as soon as you put your pen down to paper? What should you do about the background? Can you fake it with just some impressionistic foliage? Do you just leave it blank? Will amorphous colors running into one another fool anyone? Is there a more exciting composition than another warbler perched on a branch? How can you make your work look like art, have the dynamism of art? Should you use photographs as a help? What about video? How do you portray water? Do you also need bo learn to be a landscape painter. I could go on and on. My point is that in my five years of doing work based on birds most of these questions have crossed my mind. Tim's book touches on almost all of them. I don't think Tim would say that there is a definitive answer to any of them, just as there aren't to most complex questions. But he gives you his thoughts and the thoughts of other artists. These will all help any bird artist I believe, particularly those who are just starting out and feel a bit like an alien in a strange world. This book makes working from life in nature, and making art based on it, seem like the most normal and exciting thing in the world. I ordered Tim's book directly from his blog. This is the British edition and will cost extra for shipping and possibly dollar to pound currency conversion. Amazon has said it will be available in the states in July or August and I'm sure the shipping will be much less. I thought I'd hold off for the American version but eventually I just couldn't wait any longer. I'm thrilled that I made that decision. 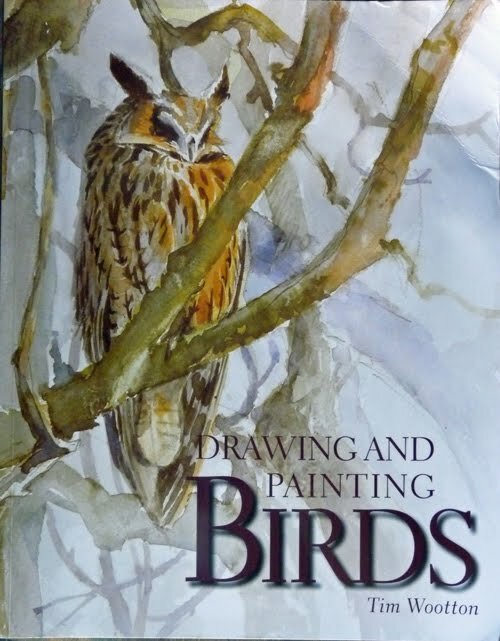 If you're not a bird artist but do enjoy art based on nature I think you'll also enjoy the book. It is full of lively and artful renderings of birds. 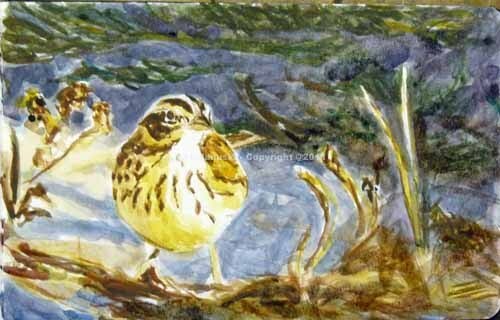 If you do come from a fine art background you soon find out how different it seems to be from that of wildlife art. And yet it shouldn't be. And here it's not. As Tim says it's hard to think of a better use of time than being in nature and making art. No,I've never been to Savannah, let alone seen a sunset there. The title refers to a handsome Savannah Sparrow seen at sunset at the top of the dunes at 'The Meadows' at Cape May, NJ last November. At that time most everything is in shadow with light just focused on small areas. In this case it was this Savannah Sparrow, with a bit of a yellowish wash caused by the sunset and everything else in purplish-blue shadows. I didn't do any field sketches then. It was cold since it was November and the wind always whips off the ocean as you cross the dune. But the scene was striking, both the sparrow who is always handsome, like a refined Song Sparrow, and the play of light and dark. So I took a number of photos. I've looked at them many times wondering about doing a painting based on one. But something's always put me off. Maybe the cliche of sunlit focal point and purplish-blue shadows. Today however I couldn't resist a quick, small watercolor. 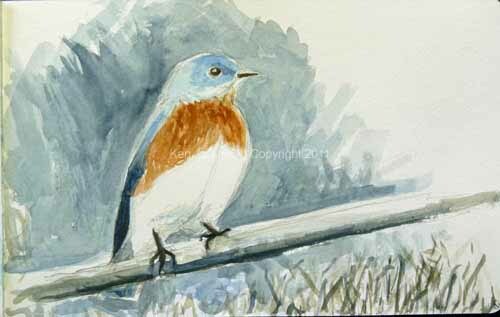 Like the last one of the bluebird this is done on the tiny 5x8.5 inch pages of the Moleskine watercolor sketchbook. In the past I've written about the yellows of spring. The first flowers we see seem to be yellow. Right now our 'Arnold Promise' Witch Hazel is in bloom and is yellow. It's a cultivar of the native Witch Hazel. Also our Winter Jasmine is in bloom. It's yellow. I'm not sure how much longer it will be before we see the first yellow blooms on our Spicebush. It's one of the pleasures of late winter/early spring to see these yellows and sometimes pale greens. One of the first posts in my proto-blog, a web site that eventually became this blog, was about the blues of fall. This wasn't so much because blue is a typical color of fall birds. It's not. But I did happen to see a number that day: Black-throated Blue Warber, Blue-Headed Vireo, Great Blue Heron. But I've never written about the blues of spring. Until today. Yesterday we saw a pair of Eastern Bluebirds at Morris Arboretum. Though bluebirds are often in Philadelphia through the winter these were the first we saw this year. As they were around a nest box we hope that they'll nest there. Our only other first birds of the year yesterday were Brown-headed Cowbirds. You can guess which we were happier to see. 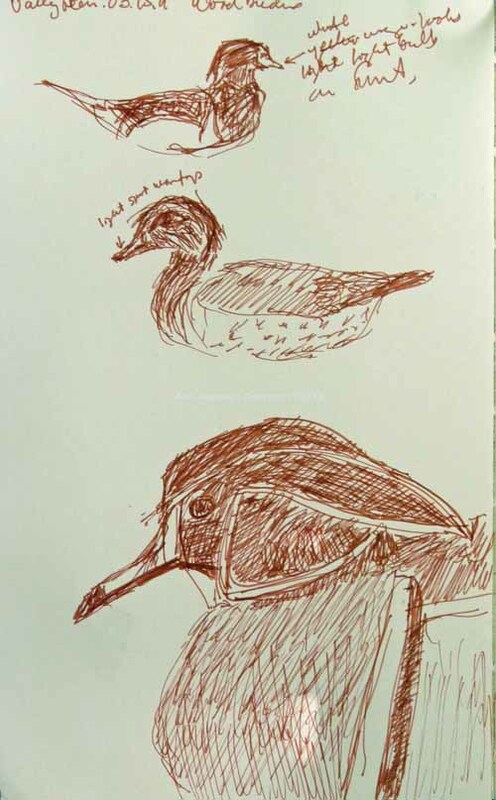 I started a field sketch of the bird at top. But as soon as I did he flew. So I and my wife decided to have our lunch of bread and cheese. As soon as we did the male came back and sat so that he was focused in the scope. But I knew if I put my lunch down and tried to sketch he'd fly. So I kept eating and he kept sitting. Ten minutes later I finished and started to sketch. Whoosh! Gone again. About 10 minutes later I took some photos nearby of the same birds. One of them eventually became the source of this watercolor. Unlike my last field sketches of Belted Kingfishers and Painted Turtles I just couldn't convince myself to to a complicated composition here. The birds are just so beautiful in themselves that I decided to keep it simple. This is watercolor on a tiny 8.5x5 inch Moleskine watercolor sketchbook. Though I love the drawing sketchbook I've never at all liked the watercolor sketchbook. But perhaps I'm just finally learning how to use it. In any case it was all that I had available today and it sufficed. Appropriately enough Corey over at 10000 Birds had a post on the Eastern Bluebird and John Burroughs' poem celebrating it today.